This era marks the crowding of low budget Android based smartphones. It all started with Xiaomi introducing a 13k phone with features which were provided only by high end smartphones in a price above 20k or even more. Another phone recently introduced by Xiaomi was the Redmi 1S which became even more popular than the previous Mi3. In this post, I am comparing it with the new Android One phones introduces by Micromax, Spice and Karbonn in partnership with Google. Xiaomi phones are made for sale exclusively on Flipkart and to get one, you need to register for the sale beforehand. Even if you are registered, it doesn't guarantee that you will get a phone. The sale goes out of stocks in seconds and you'll probably end up getting disappointed or paying a few hundred more bucks to someone who got one for the same phone. Many of the Redmi 1s users have reported that their phone gets heated up with long use or playing games. If you don't mind your phone getting heated, Redmi 1s might be the right choice for you but if it concerns you, go for Android One. 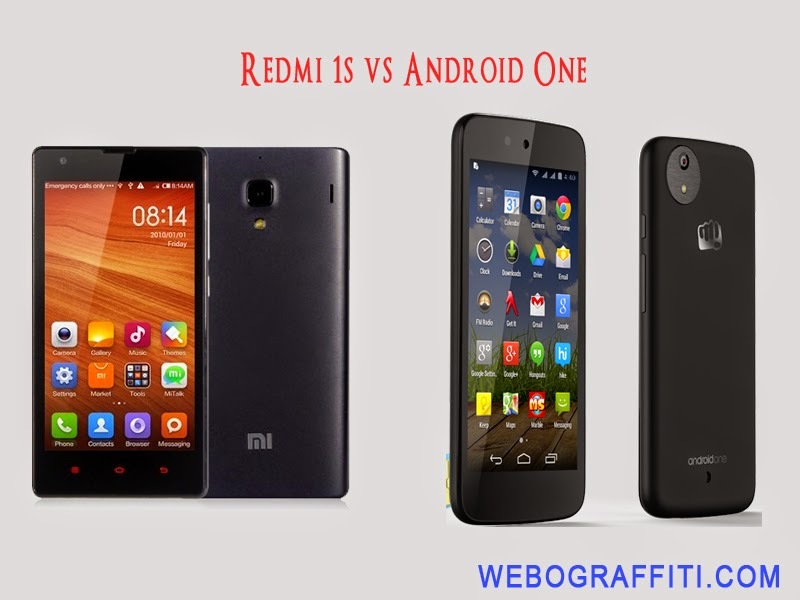 All of the Android one phones come with a stock Android version 4.4 (Kitkat), but the Redmi 1s has a customized user interface called the MIUI. If you like your phone to look like an Android phone, you must go for Android one. If you like it to look different, MIUI is the thing for you. Android One phones will get all the software updates guaranteed for two years. They will be the first ones which will run on the Android L OS and the first which will use the proposed material design. Xiaomi does not guarantee any updates. If the OS version and new features doesn't matter to you, go for Redmi 1s. Besides in box accessories, all the Android One phones are coming with exciting launch offers which include a free 8GB microSD card, free shopping coupons, free data and updates from Airtel and more. Xiaomi has limited service centres in India while the Android One manufactures beat them anytime. Micromax, Spice and Karbonn all have a service centre in my city but for getting a Redmi 1s serviced, I would have to travel 300km as this is the distance to the nearest service centre from my place. These are the standard 6 reasons to go for Android One devices. Below are possible drawbacks you'll see with the same. Lower configuration as compared to Redmi 1s (RAM, processor, screen resolution). Lower camera resolution and quality. Stock Android, if you don't like it. So this is all in this post. I hope it gave you a clear picture about which one you should go for. Let us and the other readers know what you think in the comments section below. Thank you for reading.